The most magical place on Earth is not always the most magical place. It can be stressful, overwhelming, and crowded. This can be difficult for any parent to navigate but this task can seem like climbing a mountain with two ton boulders tied to both your ankles for a special needs parent. As a special needs mom, I can relate. Making the most stressful – I mean, magical place – on Earth more enjoyable may seem like an insurmountable task, but there are some tips and tricks that can make your little one’s experience at Disney the best time of their lives! This may seem like a no brainer, but with all the excitement that goes into a Disney trip it is easy to forget something. Most people are great at making sure they bring all their supplies from home, but it’s very easy to leave those supplies right there in your resort as you head out for a fun-filled day at the parks. During one of our trips my son had a colostomy bag. I thought I had packed everything and was totally prepared. An hour or two into the day at the park, his bag exploded. No big deal, I had supplies right? Wrong! I had left one of the pieces I needed to change his bag back at the resort. Luckily there were awesome cast members who helped us out, but I have learned since then to always be prepared. I make myself a checklist and post it on the exit door to the resort. I double check my day bag right before I head out the door to ensure that my magical day isn’t ruined by a not so magical moment. There are so many little accessories that can make a huge impact on your trip. Noise canceling headphones can be great to drown out the noise of the crowds, parades, and fireworks. Both of my children have sensory integration disorder, and have a hard time with loud sounds. Headphones are the only way my kids are able to enjoy the firework shows! Even regular headphones can be a huge help if your children have issues with loud sounds or crowds. Fidget toys are also a great item to have for kids who need a little sensory action while waiting in the long lines or for parades. Sunglasses can also be helpful for the bright lights that can be found all around your favorite parks. If your children have a hard time with the sun or the heat, a hat and a water mister can be a life saver. There is nothing worse than your child having a meltdown when some simple accessories could have prevented the situation. 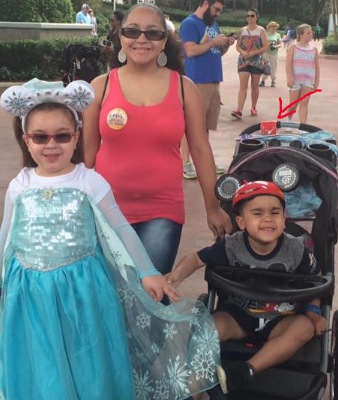 Another awesomely simple way to help create a safe place for your little one during your Disney trip is to turn their stroller into a wheelchair. My son has PTSD and has a difficult time with crowds. By turning his stroller into a wheelchair he is able to have a barrier between himself and the crowds. Since his stroller is also a wheelchair, he is able to stay in his stroller through the line queue which can be full of noisy, pushy crowds. When the crowds get to be too much my son, he just pulls his hat over his face and lays down in the stroller and is able to hide from the world. This also allows you to keep your supplies close at hand in case you need them. There is nothing worse than having to leave a line you have been waiting in for hours because your child has a crisis. Making your stroller a wheelchair can erase this problem almost completely. There have been a lot of complaints among the special needs community about the changes that Disney made to the DAS (disability access service card) a few years ago. The reality, however, is that if you are informed about the new program, it can be a life saver for you and your family. When you enter your first park on the first day of your trip, simply go to guest services and ask for a DAS. They will take the picture of the individual that the pass is for and will link the pass directly to your magic bands. The whole party gets linked, so make sure everyone is with you. Then you just go to the fast pass return queue for each ride and get a return time. That’s it! Then enjoy your time until it’s your turn to ride and simply return with all the members of your party. Everyone taps their magic band and voila! Access granted. One of the best parts of this new program is the people in queue don’t know you are using the DAS system. They simply think you have a fast pass return time. So no rude looks or comments and you get to enjoy your ride! Planning to do anything more than just the daily routines for a special needs parent can be overwhelming. The thought of trying to make a place like Disney accessible to your special one can seem impossible. But with proper planning, a few tricks, and lots of pixie dust, your vacation can be one of the most wonderful experiences each member of the family ever has.